What tax is payable on children’s investment income (minors)? over $1307, the rate is 45%. As seen from the Table, these rates are quite ‘penal’ compared to the adult rates of tax. How does the special tax rate on children’s investment income (indeed any unearned income), work? Children under 18 years (‘minors’) are subject to particular tax rules on their investment income. These rules were introduced to discourage people from investing in children’s names and accessing the lower marginal tax rates multiple times. The special tax rules apply to what is called ‘unearned income’. This generally includes bank interest, share dividends and distributions from trusts where the asset is not legitimately owned by the child (together, referable as children’s investment income). An example of this would be where a parent establishes a $50,000 share portfolio in a child’s name. Where the minor receives both excepted income and eligible taxable income the calculation is subject to other special rules. Does the special tax rate apply to the investment income of all children (minors)? In receipt of a child disability allowance, disability support pension or double orphan pension. Does the special rate of tax apply to all income earned by a minor? Excepted income enjoys the same tax-free threshold as applies to adults. This means that up to $6,000 of excepted income can be received each year and no tax paid on that income. What can be done to minimise the special rate of tax on children’s investment income? Ensure that any investments in your children’s names do not generate more income than (since the 2014 financial year), $416. Consider growth investments which produce little taxable income, but high capital growth. Invest in a product where the tax is paid for you, or is deferred until the product matures. For example, an insurance bond or endowment warrant, that will pay tax on the earnings each year and, after 10 years, the earnings will be “tax free” (really tax-paid) in your hands, so these can be quite tax-effective options for those paying a higher marginal tax rate. sell the warrants and use the funds to further their career and education. Special education plans are another option. These are simply life insurance endowment policies and receive a similar tax treatment to insurance bonds. Most are structured to mature when a child reaches a certain age, such as 18, rather than having a 10-year life. Consider incorporating a testamentary trust in your will if you want to pass income through your estate to young children and grandchildren. If the child is a beneficiary of a testamentary trust, their benefit is taxed as though they are an adult. 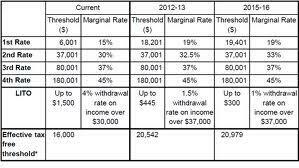 This means that the adult tax-free threshold of $18,200 applies, as do the progressive marginal tax rates. A family discretionary trust may be useful in distributing investment income in a tax-efficient manner. In this way, a small amount of income can still be distributed to children tax free, and the remainder distributed to adults. Whilst penalty tax rates have deterred the common practice of simply placing an investment in a child’s name, with careful planning astute parents can still uncover an array of favourable investment opportunities. Seeking advice on securing your child’s financial future? Continuum Financial Planners Pty Ltd provides a holistic approach to financial planning embracing wealth accumulation and protection strategies: ‘we listen, we understand; and we have solutions’ to investment dilemmas such as the special rates of tax applicable to children’s investment income – and we can deliver those solutions to you in personalised, professional wealth management advice. To arrange a meeting with one of our experienced advisers, call our office (on 07-34213456), or use the Contact Us facility on our website. ContinuumFP is a professional wealth management business: a trusted source of financial planning tips and information. Your information will NEVER be shared or sold to a 3rd party!